What Do Chinese Leaders Believe? Do Chinese leaders truly believe in Communism? What do Chinese leaders believe? The question often gets asked. Perhaps this is because the Party itself has a well advertised commitment to Marxism, and that implies an ideologically coherent body of beliefs, a core series of intellectual and political commitments which people assume leaders buy in to. Maybe the question is also provoked by the fact that despite this public commitment, the Party seems to disprove these beliefs daily. China is capitalist, people say, so how can the Party continue in this illusory position of saying it is communist when everything it does implies the opposite? This paradox cries out for explanation. It might be, however, that this question about what Chinese leaders believe is a red herring. In Western systems, we tend to answer the question of political leaders’ beliefs by looking at the political party they have chosen to be members of, and then seeing how their announced social and international policies align with a broadly left wing to right wing spectrum. But in recent years, politicians like former British prime minister Tony Blair or current U.S. president Barack Obama might be best described as figures with hybrid beliefs, working pragmatically in systems where there were only a couple of areas (with Blair, foreign wars, and with Obama, healthcare) where they were expected, or allowed, to let their convictions show through. Chinese politicians never even have this brief moment of choice in the way Western ones do. If they want to enjoy leadership careers in politics, then it is the Communist Party or nothing. So they need betray nothing of their inner convictions in their choice of which party to join. The most that they can do is to express specific opinions after they join, for instance, on the role of markets, reform of state owned enterprises, and the rate of internationalization of the renminbi. Asking fundamental questions about the system, and the Party, will not get them many friends. In fact, it will prove positively dangerous. Their convictions, if you can call them that, are inherited ones. And unlike with Western politicians, their function is not to persuade the public and use that as a means of forging new positions, but to maintain rigid external unity, even if they are privately arguing about specific issues within. In many ways, the Communist Party is akin to a faith community. People do not join it because of rational calculation and a conclusion that sinified Marxism is the best means to understand the reality around them. They join more through often unarticulated, and frequently incoherent, notions of belief – belief that the Party will help make China strong, for instance, or that it will preserve stability, or pragmatic acceptance that it is the only entity that will work currently because it is the only one allowed to. Agonizing over other options is a luxury, or a waste of time. You either take the leap of faith and join, or you remain an agnostic (the vast proportion of the rest of society) or an atheist (the core of truly committed ideological opponents of the Party, a small number). For the great raft of Party agnostics in Chinese society, their attitude might be like the British writer Auberon Waugh when asked in the 1980s why he was a Catholic: “It solves lots of boring, impossible questions so I can think about more useful things.” To many Chinese, the Party is just part of the landscape. Its language and ideology are remote background noise – white noise, which they have grown very adept at blocking out. With good growth, and daily social change, they tolerate the Party, and accept it. They probably think of the word “Communist” like Westerners think of the word “Co-operative” in a shop name – not as an indication of political commitment, but just as a label, acquired so long ago that no one really knows what it means any more. But this vast group does expect their leaders to believe in the Party’s stated faith. Like notional Christians who expect their priests to coherently believe and follow doctrine even while they themselves never bother much asking questions about it, Chinese people and rank and file Party members do probably want their Communist Party leaders, at least at the top, to mean what they say when they announce they are followers of “socialism with Chinese characteristics.” A Chinese leader simply announcing that they did not, in fact, subscribe to this would be akin to the Pope declaring he no longer believed in God. It would tear fundamentally at the Party’s identity and its legitimacy. Its elite leaders have to look like they believe in their dogma, even if no one else does. In that context, Xi Jinping does believe in socialism with Chinese characteristics. He believes in it because previous leaders also said they believed in it, and this sort of elite unity across generations is important. He believes in it because it is the only option ever available for those aspiring to acquire political power in China, and doubting it offers no incentives if you want to take the route he has. But finally, he believes in it because he, and perhaps he alone, as the head of this curious hybrid entity still running China in the 21st century, has to. Ironically, while most other Chinese people do have some freedom of inner belief and private agency, Xi, like the Pope, has no such latitude. 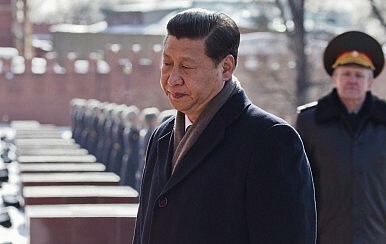 He might be the last person in today’s China who truly believes in Communism with Chinese characteristics, but he is the only one that truly has to.